With the possibility of grace. Then I don’t have to believe. That line from the anthem the choir just sang reminds me of the words of John Muir. The changing of the seasons can sometimes seem to mirror the changes in our lives. Very little in life stays the same for very long. Some of this will be about what I have come to believe about God. First, how many people here have dogs? Do you love your dog? 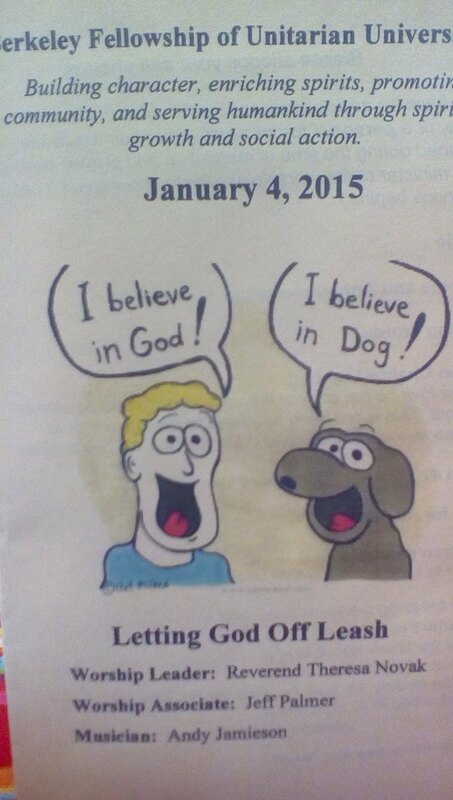 There are a lot of jokes around the fact that God is Dog spelled backwards. That makes sense if you love dogs – and for some of you, loving a dog is much easier than loving God. This leads me to wonder that if God were in fact a dog, what kind of dog would God be? A stately Great Dane perhaps, high above it all? A St Bernard, coming to the rescue? A practical Collie like Lassie or maybe a Golden Retriever who just wiggles with love? Some people may see God as a Pit Bull waiting to snarl everyone into hell in short order if they don’t shape up. When I look at a Pug, I sometimes wonder if God might often have a similar expression. Now, I know, and you know, that God is not really a dog, except of course in the sense that there is a spark of the divine in all living creatures. But I think sometimes we humans can treat God like a dog. Not badly, I don’t mean that. But I think sometimes we tend to treat God as our own personal pet. We keep God on a leash, in a box, under our control. I think this is true even for folks that don’t believe in God. They usually have a quite definite image of the God they don’t believe in. When I was young, I thought of God as an old bearded white man who sat on a golden throne, high in the sky, amidst fluffy clouds, with sweet-faced plump cherubs fluttering about him. A child, if they have courage, might want to climb up into the lap of that sort of God, the view alone would be worth it I think. If that God became angry, however, the clouds went gray and lightening flashed. Any sensible child would run for cover. Which is exactly what I did, and I stopped believing in God for a very long time. Those childhood images of God stayed with me, though. I didn’t believe in that old man in the sky, but it was him that I didn’t believe in if anyone asked me about God. Some sociologists say that the process is just the reverse, that humans create God in their own image, or an image that signifies an ideal in the common culture. Old white men were the ones with all the power while I was growing up. No wonder that is what God looked like to me. All of us, whether we are believers or unbelievers, tend to carry around with us images of what God is and is not. We need to pay attention to those images, to what we think about even the God we may not believe in. Because God is a cultural symbol of what is ideal, what is the most valued; our image of God can affect how we are with ourselves and with each other. If we see God as perfect and unchanging, how do we see our own need for change? If we see God as all-knowing do we somehow get the idea that it is possible to know everything? If we see God as all powerful, do we think that if we don’t have the power to change things in an absolutely Godlike way, then we can feel that it is not worth trying. Several things happened to me that shattered my old image of the God I did not believe in. The first was shortly after I retired from Social Security. I was in the hospital for several days, undergoing a number of tests. Everything turned out fine for me, but in the next bed was a woman who had just been told that her heart was giving out and she had only a month or so left to live. She was crying and worrying that she was going to hell because of how she had lived her life. I started channeling John Murray. I told her firmly that there was no hell, that a God that would send people to hell makes absolutely no sense at all. I still didn’t believe in God, but it was a different God whose existence I questioned. Then I read Rebecca Parker’s Proverbs of Ashes. A lot of that book is about her being sexually molested as a child. While talking with her therapist, she comes to the realization that God was with her in those moments when she was being abused, holding her in love, and that even if she died, would continue to hold her. What most struck me while reading that was the God she was talking about wasn’t all powerful. That God could love her and hold her, but could not prevent what happened. I still didn’t believe in God, but I stopped believing in a God I could blame for all the bad things in the world. In seminary, I dove into theology and in particular I loved Charles Hartshorne, a UU theologian. In his book, Divine Relativity, he critiques the traditional image of God. A wholly absolute God can provide no lasting good inclusive of human achievement…. Maybe God is like that, a value deeper than truth, or what we can conceivably know as factual, provable truth. Maybe it even doesn’t matter so much what God really is, what the “truth is,” but instead it may be more important to believe – or even not believe – in the sort of God we need. If God is truly God, then God will be the God the world needs. That should, I think, be part of the definition. I then started to ask the question, “What kind of God would serve us well, here, today, in the twenty-first century?” What God could be more inclusive of diversity, more responsive to oppression, better able to help us get along with others in peaceful and loving ways? What kind of God could help us face and do what is before us now to face and do? What could it mean to us if we began to see God not as absolute and unchanging, but as relational? What if God was a sensitive, changeable presence, one that interacted with the world rather than ruled it? What if we took God out of the box, off leash so to speak? Maybe we could start imagining God as the best of what humans have the potential to be. Unlike the image of the old man in the sky, this relational image of God can inspire love and compassion rather than awe and fear. The following poem by WEB Du Bois, an African American born shortly after slavery, expresses this well I think. Help! I sense that low and awful cry — Who cries? Who weeps? With silent sob that rends and tears — Can God sob? Who prays? 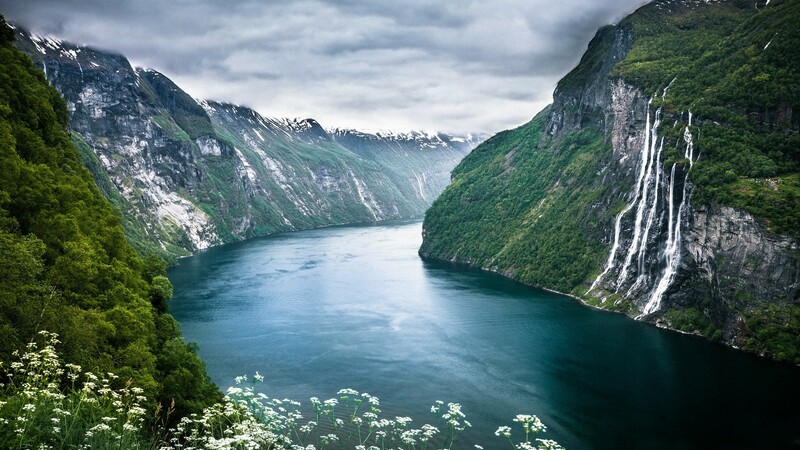 I hear strong prayers throng by, Like mighty winds on dusky moors — Can God pray? Prayest Thou, Lord, and to me? Thou needest me? Thou needest me? Thou needest me? Poor, wounded soul! Of this I never dreamed. I thought — Courage, God, I come! Du Bois’ poem is somewhat startling. It portrays a God who is not all powerful, who needs our help in fact. Can we imagine God that way? When it comes to love of other people it is usually their imperfections that draw us. Our best friends are often those who are willing to share some of their vulnerability, some of their fears. We can trust these friends with our own failures and also cheer their triumphs and successes with full and open hearts because we know something about their struggles. Can we learn love God in the way we love those friends? After learning about different ways to imagine God, I decided to stop worrying about whether God existed or not. Once I did that I began to both remember and experience moments in my life where I felt the presence of something deeper and larger than just me. Those moments I would describe as transcendent and they have happened at relatively random times. Sometimes when I am writing or speaking from the heart I get the feeling that the words are coming from someplace else. I have also sometimes felt something powerful in hospital rooms where I sat people who were in the process of dying. Call it the spirit of life, call the strength of the human spirit, call it magic, call it whatever you will, or call it nothing at all. I choose to name that awesome something, that mystery that cannot be fully described, I choose to call it God. And perhaps, if God were really a dog, it wouldn’t be a purebred at all, but instead a shaggy, floppy eared mutt who loves freedom and is interested in the world. A street dog that knows the ways of the world. A dog who is not perfect, who is not all powerful and unchanging, and who, like us, needs both courage and compassion. May we all find courage. May we all find compassion. May we all find an image of God that we can unleash and let run free through our lives and through the world. Blessed be. I like bumper stickers. One that I used to see a lot said, “Dog is my copilot.” You may have seen that one too. It was a play on the phrase, “God is my copilot.” Dog is God spelled backwards after all. The dog one was much more popular for a time though. People do love their dogs, and most dogs just love riding in cars. Some folks may also have wanted to poke a bit of fun at the idea that God is standing around waiting to help us find our way home, through traffic. This all leads me to wonder that if God were in fact a dog, what kind of dog would God be? A stately Great Dane perhaps, high above it all? A St Bernard, coming to the rescue? A practical Collie like Lassie or maybe a Golden Retriever who just wiggles with love? Some people may see God as a Pit Bull waiting to snarl everyone into hell in short order if they don’t shape up. When I look at a Pug, I sometimes wonder if God might often have a similar expression. When I was young, I thought of God as an old bearded white man who sat on a golden throne, high in the sky, amidst fluffy clouds, with sweet-faced plump cherubs fluttering about him. A child, if they have courage, might want to climb up into the lap of that sort of God, the view alone would be worth it I think. If that God became angry, however, the clouds went gray and lightening flashed. Any sensible child would run for cover. Which is exactly what I did, and I stopped believing in God for a long time. Those childhood images of God stayed with me, though. I didn’t believe in that old man in the sky, but it was him that I didn’t believe in if anyone asked me about God. Some sociologists say that the process is just the reverse, that humans create God in their own image, or an image that signifies an ideal in the common culture. Old white men were the ones with all the power while I was growing up. No wonder that is what God looked liked to me. Talking about God in a Unitarian Universalist church can be a tricky business at times. Some Unitarian Universalists, when the idea of God is even mentioned, bring out the metaphorical garlic. Usually these are folks who, like me, were raised with a fairly traditional idea of God. If we see God as perfect and unchanging, how do we see our own need for change? Do we remain stubborn in our own Divine right to stay the way we are, hanging on to maybe some bad habits just because they are our own? Or do we maybe feel bad, because we aren’t perfect, and feel we should be? Are we too harsh with our friends and family, seeking perfection in them too, and becoming angry and disappointed when they inevitably fall short? Do we let others change and grow, even if we are afraid that if they change that they will somehow leave us behind? If we see God as all knowing do we somehow get the idea that it is possible to know everything? What does it say about the need for lifelong learning, about humility even in our strong opinions? Do we feel stupid because we don’t know everything, or do we tend to act like “know it alls? It plays out at the societal level, our image of God. If we imagine a judgmental God, we might believe that only the so-called “deserving poor” should be helped by society. We can be impatient with those who don’t agree with us, judging them stupid and ill-informed. If we see God as all powerful, we may be tempted to sit back and let some divine force do all the work for justice that is in fact our work to do. Even if we don’t put that on God, we can put it on others. We get the idea that if we don’t have the power to change things in a very powerful, in an absolute Godlike way, then we can sometimes feel that it is not worth trying. We relinquish what power we do have and yearn for the “government”, the “democrats”, the board of trustees, the minister, the committee chair to see the light and take the appropriate action. Most important, though, on a spiritual level, how we image God can affect our own sense of well being, our sense of our purpose in life. A limited image can narrow our sense of possibility, of who we are, and who we can become. It is also deeply insulting to the Divine Spirit of creative force that is within us all. If we put God on a pedestal, way up in the clouds, it is harder to feel the spirit fully as it moves in our daily lives. God becomes an abstract concept, disembodied, something that has no relevance for us at work, in our homes, or even in our churches. Charles Hartshorne, a UU theologian, in his book, Divine Relativity, critiques this traditional image of God. Maybe God is like that, a value deeper than truth, or what we can conceivably know as factual, provable truth. Maybe it even doesn’t matter so much what God really is, what the “truth is,” but instead it may be more important to believe – or even not believe – in the sort of God we need. If God is truly God, then God will be the God the world needs. Shouldn’t that be part of the definition? Power and perfection are two of the traditional attributes of God that I think most need reconstruction. If God is all powerful, then God is responsible for all the horrors in the world as well as all the goodness and beauty. Do we want to honor and worship power in this way? Doesn’t worshiping power lead to unjust wars, to imperialism? Does it serve our local communities when the powerful are more honored than the weak and vulnerable? A God who shares power with us, who helps us develop our own strengths, is more the kind of God I believe we need. Not a tyrant or a dictator. If we worship a dictator God, it is too easy to search for that in our human leadership as well. Martin Luther King said that “power without love is abusive and love without power is sentimental and anemic.” He said that “power at its best is love implementing the demands of justice, and that justice at its best is power correcting everything that stands against love.” That old image of God hurling thunderbolts and hurricanes from the sky is an abusive and limited one. I think we can honor God and still ask the question. “What kind of God would serve us well, here, today, in the twenty-first century?” What God could be more inclusive of diversity, more responsive to oppression, better able to help us get along with others in peaceful and loving ways? What kind of God could help us face and do what is before us now to face and do? Maybe we could begin to see change as something good, that growth in ourselves and in other people is a natural thing. Maybe we could also stop beating ourselves up for who we are now and stop worrying so much about who we aren’t yet, what dreams are still out of our reach. Maybe we will even stop being embarrassed about who we used to be. We might learn to accept and love ourselves and each other in our actually quite glorious imperfections. If we carried the ideal of relationality into the world, if we identified the divine nature as one who is supremely sensitive to others, maybe we would learn to listen to one another better. Maybe we could begin to understand those with different life experiences from ours, those with different views, different politics. Maybe we could find some common ground if we aren’t all stuck in the paradigm of always being perfectly and absolutely correct. On a spiritual level, if we understand God as a presence that truly interacts with us, that changes when we change, a tremendous power could be released into the world and into our own souls. We could work with the God force, not simply for it or against it. We could be major players on the Divine team, in partnership, in community. Unlike the image of the old man in the sky, this relational image of God can inspire love and compassion rather than awe and fear. The following poem by WEB Du Bois, an African American born shortly after slavery, expresses this well I think. How different than that judgmental lordly figure – a God that is wounded, that weeps, that is vulnerable. I have never been able to really wrap my brain around the orthodox version of the Christian trinity, and I believe that Jesus of Nazareth was fully human, but I can see the appeal of a God who suffers with us, one who really knows our pain, because that God feels pain too. What draws us closer to other people? Do we really like best those who seem perfect? Don’t we instead appreciate more someone who is trying? When it comes to love of other people it is usually their imperfections that draw us. We want to help a friend in pain. Our best friends are often those who are willing to share some of their vulnerability, some of their fears. The ones that are patient with us, that listen. We can trust them with our failures and also cheer their triumphs and successes with full and open hearts because we know something about their struggles. Can we love God in the way we love those friends? Perhaps, if God were really a dog, it wouldn’t be a purebred at all, but a shaggy, floppy eared mutt who loves freedom and is interested in the world. A God who is not perfect, who is not all powerful and unchanging, who like us, needs both courage and compassion. May we all find courage. May we all find compassion. May we all find an image of God that we can let run free through our lives and through the world. Blessed be. Earlier, I told a story about playing hide and seek with God. It is easier to find something if you know what you are looking for. Think for a moment if you will, think about how you picture God. If we see God as all knowing do we somehow get the idea that it is possible to know everything? What does it say about the need for lifelong learning? Do we feel stupid because we don’t know everything, or do we tend to act like “know it alls? It plays out at the societal level, our image of God. If we imagine a judgmental God we might believe that only the so-called “deserving poor” should be helped by society. We can be impatient with those who don’t agree with us, judging them stupid and ill-informed. If we see God as all powerful, we may be tempted to sit back and let some divine force do all the work for justice that is in fact our work to do. Even if we don’t put that on God, we can put it on others. We get the idea that if we don’t have the power to change things in a very powerful, in an absolute Godlike way, then we can sometimes feel that it is not worth trying. We relinquish what power we do have and yearn for the “government”, the “democrats”, the board of trustees, the minister, the committee chair to see the light and take the appropriate action. Martin Luther King said that “power without love is abusive and love without power is sentimental and anemic.” He said that “power at its best is love implementing the demands of justice, and that justice at its best is power correcting everything that stands against love.” That old image of God hurling thunderbolts and hurricanes from the sky is an abusive one and it is a limited one. What you do in my name. The warmth of a sunlit field. Hold it close in loving arms.